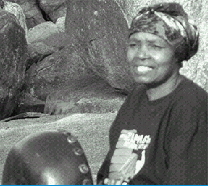 Beauler Dyoko, known in Zimbabwe as the "Queen of Mbira Music,"was Zimbabwe's first woman mbira recording artist. She passed away in June 2013. She was leader and featured singer with the popular contemporary mbira ensemble, The Black Souls, and had regularly been invited to perform a traditional song to open the Zimbabwean Parliament. She also performed with Mhuri yekwa Rwizi/Soul of Mbira groups for many years in Zimbabwe and throughout the world. Beauler was also a spirit medium, an herbalist, fashion designer, and teacher of traditional Shona cooking. Beauler was an active member of organizations promoting women musicians in Zimbabwe, and wrote original songs in support of AIDS awareness and non-violence. She was the sole supporter of a large extended family of grandchildren, nieces and nephews in Zimbabwe. Mbira players-learn from Ambuya Beauler at Tinotenda's From the Source mbira lessons. Four songs now, more to come.